Got Mold? Are You Handling It Properly? Day in and day out, restorers like you are dealing with wet and sometimes moldy environments. In water restoration, you will come across mold. What happens when you find mold? Many handle the mold remediation in house. But are you handling it properly? It’s something we all have to think about because of the dangers and liabilities of mold. Mold mycotoxins can have potentially serious health effects on many. In fact, research has shown that about 25 percent of the population has a genetic predisposition to being overwhelmed with these exposures, even at relatively low levels. Well, what is a mycotoxin? It’s defined as any toxic substance produced by a fungus. Mycotoxins can have varying effects. Some can cause cancer, some suppress the immune system, and much more. This highlights the necessity to clean the environment properly, whether we can see visible mold growth or not. No doubt many have become equipped to handle mold by taking an IICRC AMRT certification course. 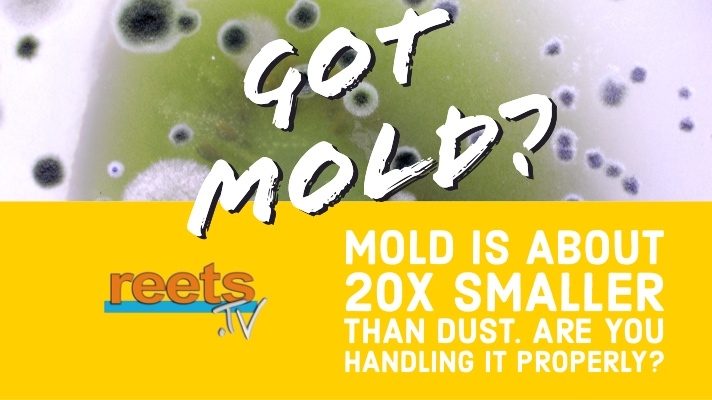 Why not make sure all your technicians are equipped to handle the necessary processes of mold remediation with our ReetsTV online mold remediation course. Our online course walks you through all the necessary steps of remediating a structure from beginning to end. Click below to learn more now!